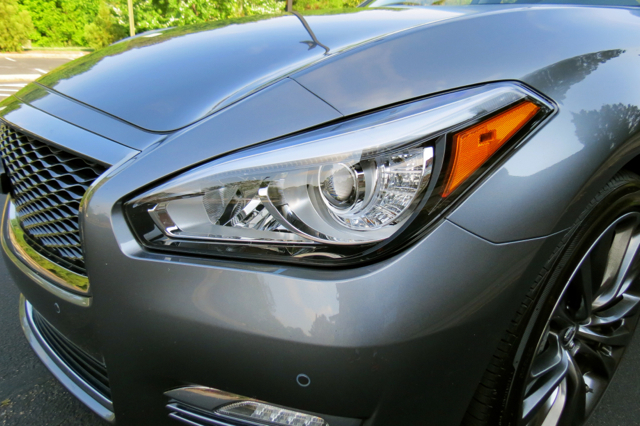 Infiniti’s largest and most luxurious sedan. The extended wheelbase Q70L straddles mid- and full-size luxury sedan segments. Lacking a true full-size luxury sedan, Infiniti comes closest with the Q70L, a stretched wheelbase version of its midsize Q70 sedan. Infiniti’s largest sedan offers an extra five inches between the wheels, delivering a roomy rear compartment rivaling certain limousine-like models. Yet, the Q70L is about four to five inches shorter overall and some three or four inches narrower than the big guys. Thus, its direct competitors include the BMW 5 Series, Lexus GS, Cadillac CTS, Mercedes-Benz E-Class, Genesis G80, Volvo S90 and the Audi A6. Larger sedans such as the BMW 7 Series, Lexus LS, Mercedes-Benz S-Class, Genesis G90, and the Audi A8 fall just outside of that range. Lucky for me it was the stretched wheelbase Q70L serving as a recent weekly driver. This model retails for $51,600 or just $1,500 more than the standard wheelbase model. 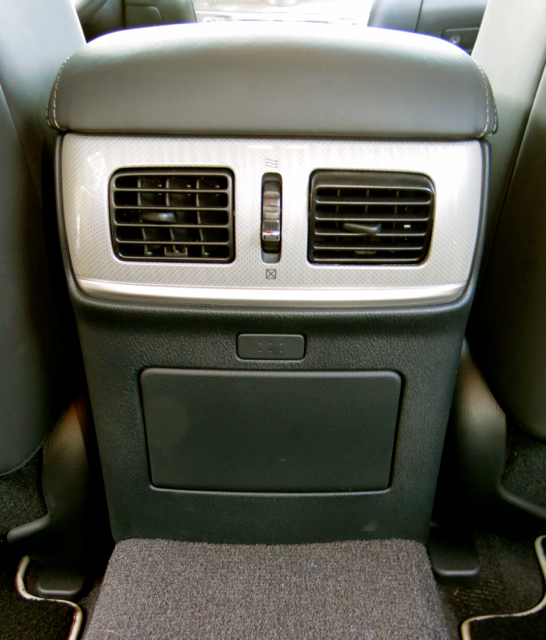 So, for just $300 an added inch, you get extra space your rear-seated passengers will love. 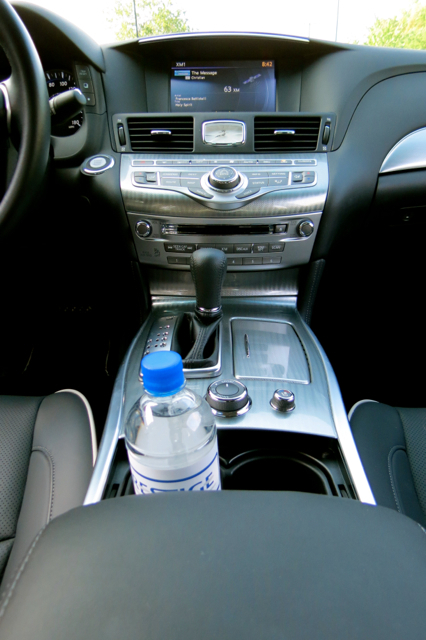 Like other luxury models, the Q70 comes packed with luxury touches and amenities. Trim level changes correspond to engine size and the drivetrain. Thus, a rear-wheel drive Q70 powered by the V6 engine retails for $50,100. Choose all-wheel drive and you’ll pay $52,250. A rear-wheel drive Q70 with the V8 engine costs $63,150 or $65,700 for all-wheel drive. A separately marketed hybrid variant with a 3.5-liter V6 engine costs $56,200. 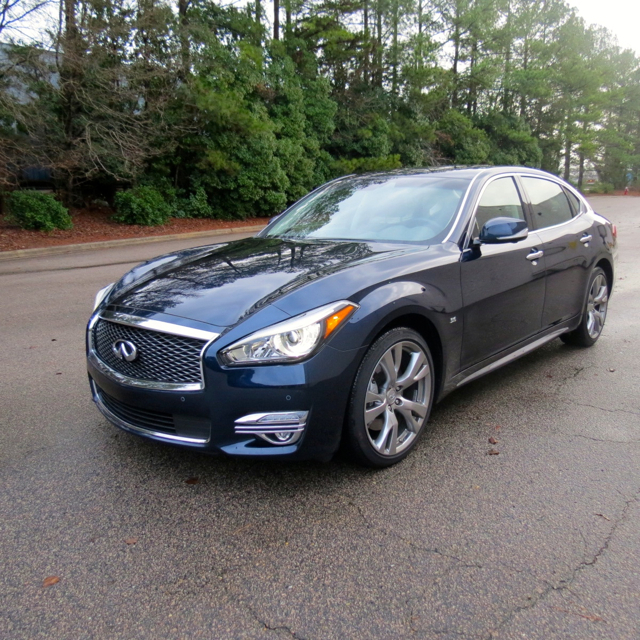 As for the Q70L, the base engine with rear-wheel drive retails from $51,600 or $53,750 with all-wheel drive. Step up to the V8 and you’ll pay $64,850 or $67,400 for rear- or all-wheel drive, respectively. Add $905 for the destination charge. My all-wheel drive test model with the V8 engine came in at $69,055, including $3,500 for the Premium Select edition. The upgrade brought in multiple exterior and interior embellishments, including a rear decklid spoiler, uniquely designed 20-inch wheels, sport brakes, illuminated kick plates, dark finish interior trim, a suede-like headliner, aluminum interior trim, and upgraded floor mats. 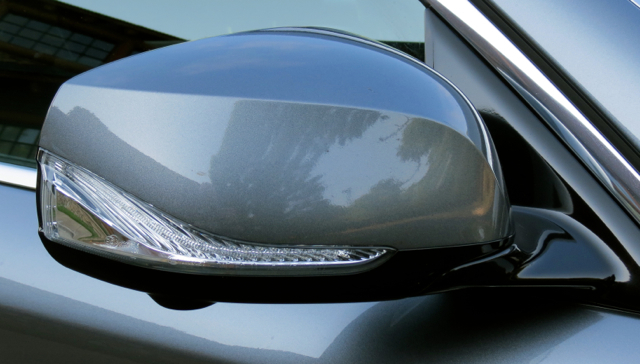 The Q70/70L projects a muscular stance with its curvaceous grille, hawk eye headlamps, and sporty air intake. A bolstered hood and robust shoulders only amplify the sedan’s strong appearance. 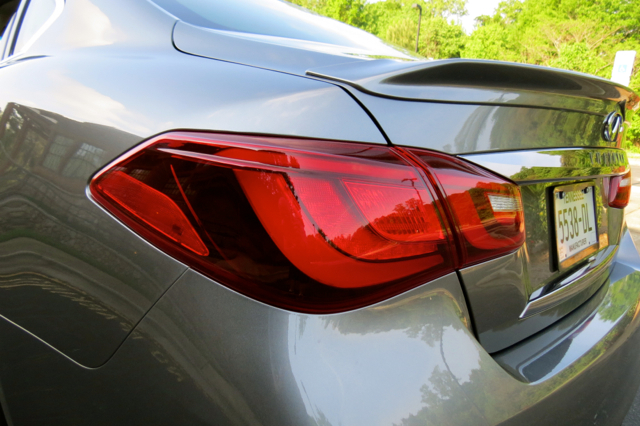 Beautiful flowing profile lines from front to back emphasize that this is no ordinary sedan. Moreover, a long flowing roof line, body sculpting, and available rocker panel trim offer further amplification. From the rear, the raised deck offers an available spoiler and chrome garnishment. Oversized wraparound combination lamps, rear fog lamps, and dual exhaust ports round out the look. An assortment of wheel choices is available. Notably, my test model came outfitted with Bridgestone Potenza summer tires. Opting for the extended wheelbase model seems wise and cost effective. Indeed, for a modest price increase, you’ll come away with extra rear legroom that only benefits the rear-seated passengers. 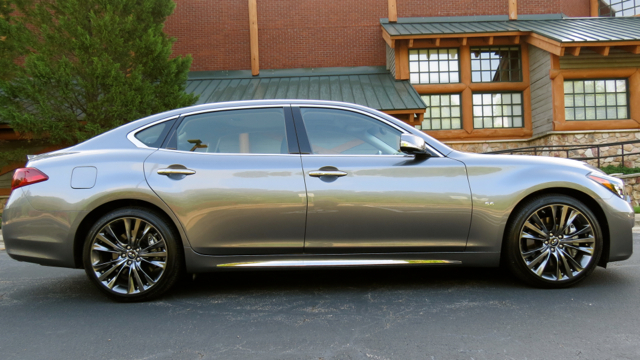 This model seats five in comfort, but if you’re looking for a limousine-like compartment, the Q70L delivers. 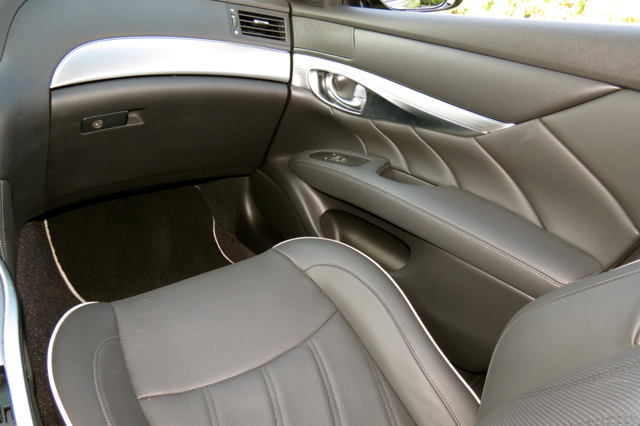 I’ve long been a fan of Infiniti interiors, enjoying the fit and finish as well as the quality of materials used. The Premium Select edition is like adding icing to the cake — it simply provides the added panache befitting the sedan. The cockpit offers a sporty presentation with a pair of analog displays on either side of a digital driver’s information center. A curved panel hood adds a sporty touch. The center stack comes topped with chrome trim, while a color display sits in a recess directly beneath. Just below that is an analog clock situated above a panel of buttons and knobs for controlling the infotainment and climate control systems. Yes, this model still has a CD player — and that’s something that made this driver happy. Between the seats is the transmission shift stick, along with heating and cooling knobs and the drive select knob. Chrome plating provides an elegant touch for that surface. A deep storage compartment doubling as an armrest is also present. You’ll find USB ports and a 12-volt outlet inside. Other touches include generous use of leather covering the seats, wrapping the steering wheel, and dressing the door inlays. Happily, plastic is not commonly found anywhere. All other materials are of the soft-touch variety. 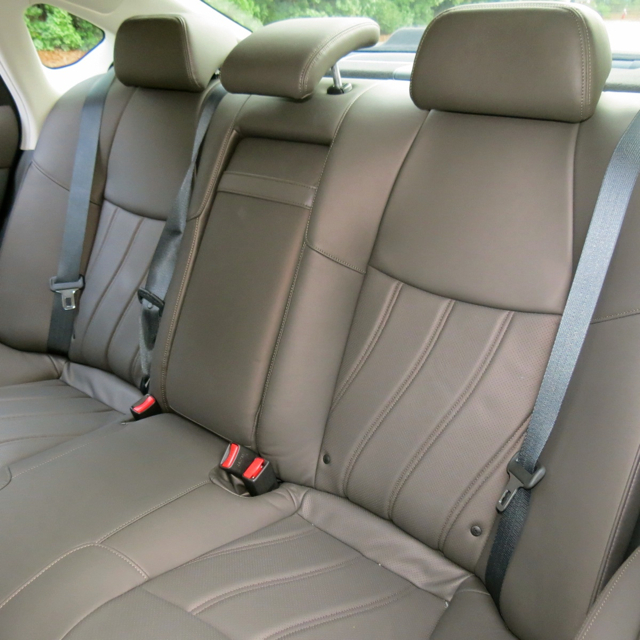 As for the rear seat, three can sit in a pinch, but that area is most comfortable for two. Drop the middle armrest in place and you’ll find two drink holders, a pair of heated seat switches, and a sizable storage compartment. 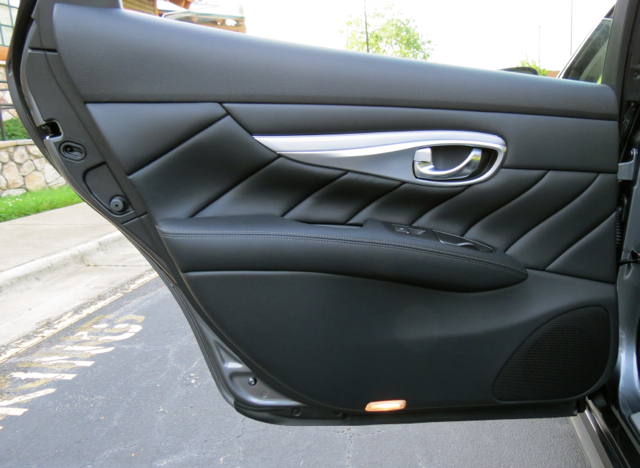 You’ll also find the armrest supplies pass-through access to the trunk. Standard equipment includes keyless entry, push-button start, an electronic tilt and telescopic steering column, 10-way power heated front seats, dual-zone climate control, and a dual occupant memory system. 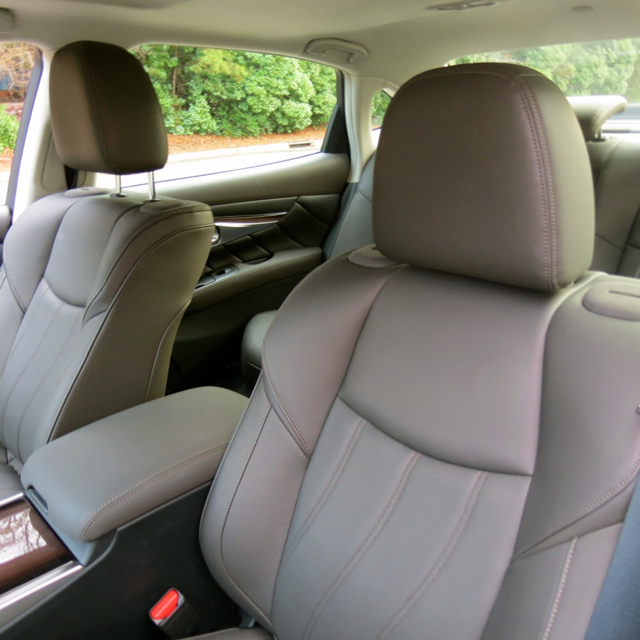 Available equipment brings in climate-controlled seats and a heated steering wheel. Interior storage space is not as generous as offered in some models. The front doors offer tiny alcoves and they’re not large enough to hold drinks. The rear doors do not provide storage whatsoever. On the tech front, the Infiniti offers a voice recognition navigation system, an around view (rearview) monitor, a 10-speaker Bose audio system, Bluetooth connectivity, nav traffic and weather, and a front and rear parking assist system. Upgrades come by means of a $3,300 technology package, what brings in numerous driver assist features, including intelligent cruise control, lane departure warning and prevention, distance control assist, forward emergency braking, blind sport warning and intervention, backup collision intervention and adaptive front lighting. As for crashworthiness testing, the 2017 Infiniti Q70 garnered a “Top Safety Pick” award from the Insurance Institute for Highway Safety. Its only demerit was the child seat anchors (LATCH) ease of use. Ratings from the National Highway Traffic Safety Administration (NHTSA) were not final as of publication. However, the nearly identical 2016 model achieved a five-star safety rating. You’re given the choice of a 330-horsepower V6 or a 416-horsepower V8 engine with the 2017 Infiniti Q70 series. Certainly, the base engine is up to the task, although the V8 is the performance maven here. Both engines come paired with a seven-speed automatic transmission with sport mode. Further, a four-mode drive mode selector dials in on whatever drive condition suits you — normal, eco, sport or snow. Naturally, I kept the V8-powered sedan in sport mode the entire time, preferring the added weightiness of the steering, enhanced shift points of the transmission, and the improved handling that goes with this. If you demand full power in your vehicle, the V8 does not disappoint. From a dead stop to hard acceleration and from passing speed to navigating twisty roads, the Q70L is up to the task. This sedan stays planted on the twistiest of roads, hanging the curves with precision, with the steering responsive. The steering system is still hydraulically operated, something enemies of electric-powered steering or drive-by-wire steering will rejoice in. Despite its size, the Q70L tips the scales at just shy of two tons. That’s a manageable weight in this class, what supplies this model with poise. For those wanting to build on the standard model, four-wheel steering is available. Whether it is selected in standard or extended wheelbase form, the Q70 delivers many of the features customers expect in this model range. The extended wheelbase version does an admirable job of providing big sedan comfort, although its slightly narrow footprint is not hard to miss. As with many luxury models, prices can quickly escalate well beyond the base price. Quite frankly, some people will find the V6 adequate for their performance needs, although the 2 mpg fuel economy edge doesn’t provide a significant edge. The outlier here is the hybrid with its 28 mpg rating and its 360 horsepower. It is a rear-wheel drive sedan, but it costs $5,100 more than the base model. Yet, the added performance also supplies an attractive middle ground between the standard V6 and V8 models. 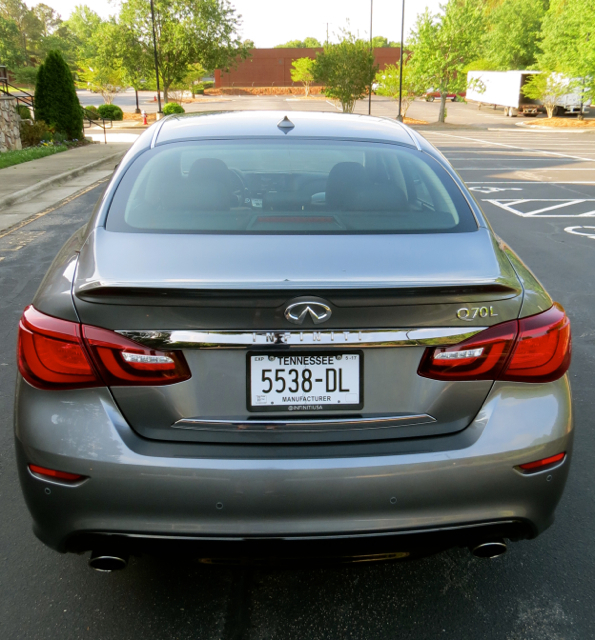 Infiniti’s athletic midsize sedan can be had in an extended wheelbase version. The elongated model delivers best-in-class rear seat legroom. The luxury market is an intensely competitive one with BMW, Mercedes-Benz, and Lexus seated as the top sellers. The first two marques rely on diesels to supplement their gasoline offerings; Lexus augments its standard models with hybrids. Further down the sales line Audi, Acura and Cadillac do battle, followed by Infiniti sitting in a distant seventh place. Infiniti may trail the leaders, but it has come on strong of late. For the second consecutive year Infiniti has achieved record sales, rising by 13.8 percent in 2015. Most of those sales were in the US where Infiniti is outpacing many of its rivals. China is a newer market and should supply Infiniti with continued growth moving forward. Infiniti is succeeding as it relies on a healthy mix of sedans, coupes, and utility vehicles to bolster its sales. A new, entry-level model arrives next year — the QX30 — sold in hatchback and crossover variations (the hatchback will be marketed as the Q30 in other markets). The Q40 sedan is now out of production, leaving the entry-level Q50 and the midsize Q70 as the remaining sedans. Buyers might also consider the Q60 line of coupes and convertibles. 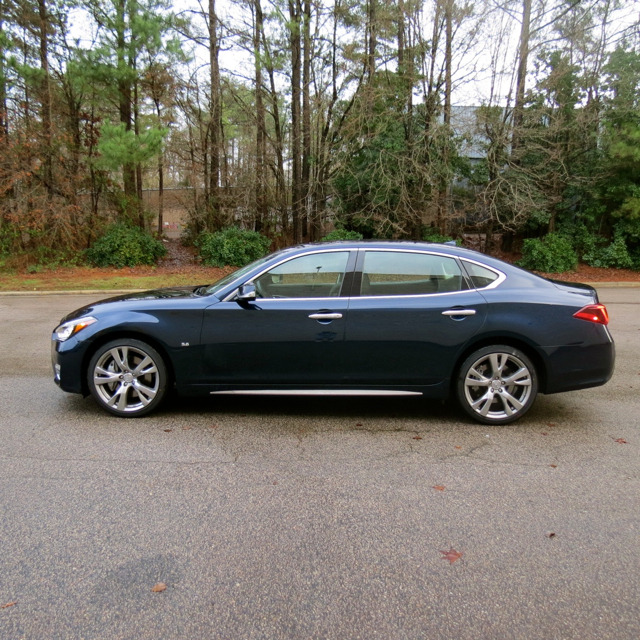 A 2016 Infiniti Q70L closed out my year of reviews, a midsize sedan with a stretched wheelbase. Also available as the Q70, the Q70L appellation denotes that 5.9 inches were added to the wheelbase, bringing this model within six inches of the full-size BMW 7-Series. The extra inches benefit rear legroom, providing 41.8 inches of space for the three rear seating passengers. Not quite matching limousine proportions, but very close indeed — and you can cross your legs. So, despite not having a flagship sedan to compete with the BMW 7-Series, Lexus’ LS, or the Mercedes-Benz S-Class, the Q70L offers a reasonable alternative. That alternative is marked by a handsome visage with a bold grille, a muscular hood, and strong shoulders. From its sides, the Q70L offers a stately appearance with its long flowing lines, rising belt line, and rocker panel ornamentation. Handsome dual-quad aluminum alloy wheels and chrome accents provide this model with added expressiveness. The roofline flows into the raised rear deck — that deck is accented by chrome ornamentation, wraparound combination lamps, and dual exhaust tips. Distinctive embrasures front and rear as well as stylish LED light treatments add visual appeal to this already striking model. Inside, the cabin is bright, orderly and uncomplicated. And that’s a good thing: some luxury manufacturers have gone tech happy (or mad), making such vehicles less than user friendly. The Infiniti Q70L is marked by flowing interior lines across the dashboard, on the instrument panel hood, along the doors, and upon the seats. That look imparts a feeling of motion with the wood trim, aluminum accents, and leather surfaces advancing refinement. Soft and hard plastics are found here and there as in on top of the doors and across a section of the dashboard — or where you would expect to find it. Infiniti prices the Q70L from $51,350 for the standard rear-wheel drive model powered by a 3.7-liter, V-6 engine. The Q70L 3.7 AWD retails for $53,500; the Q70L 5.6 (rear-wheel drive) costs $64,550; the Q70L AWD 5.6 AWD is priced from $67,050. 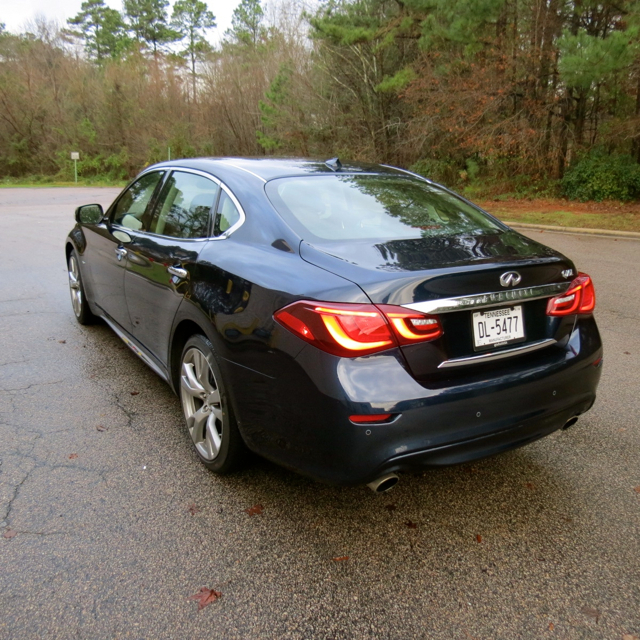 It was the rear-wheel drive Q70L 5.6 that served as my test model. All Q70L models come with a long list of premium features, including keyless entry, push button start, 10-way power heated front seats, heated outboard rear seats, dual zone climate control, a rear view monitor, and a center console display. The Q70L 5.6 brings in the larger engine and adds an around view monitor with moving object detection, a navigation system, climate-controlled front seats, a 10-speaker Bose audio system, Infiniti telematics, and a front and rear sonar system. Further customization can be had when taking one or both available packages. 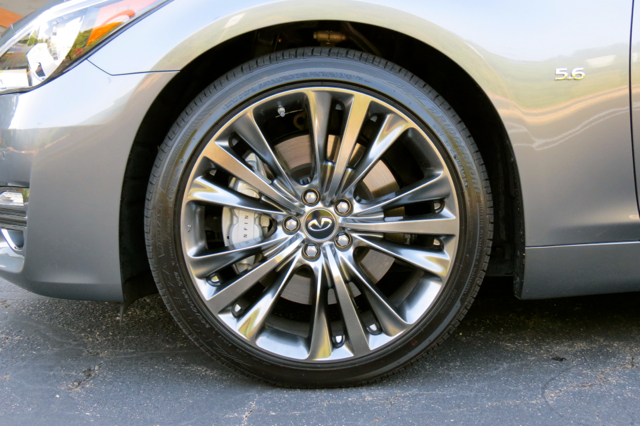 A performance tire and wheel package ($1,150) brings in 20-inch alloy wheels and sport brakes. A deluxe technology package ($7,200) adds numerous safety features, including intelligent cruise control, forward collision braking, backup collision braking, lane departure warning with lane departure prevention, and a power rear sunshade. Take every conceivable option and choose the Q70L 5.6 AWD and you’re looking at a total MSRP of $76,305 before incentives. 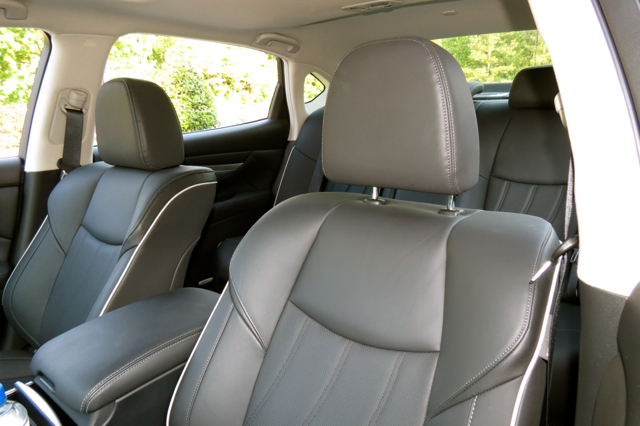 Front or rear, the Q70L offers plush, sumptuous seating for four. The middle rear seat position can hold a fifth passenger, but the pronounced drivetrain hump and hard backing should have most people thinking otherwise. 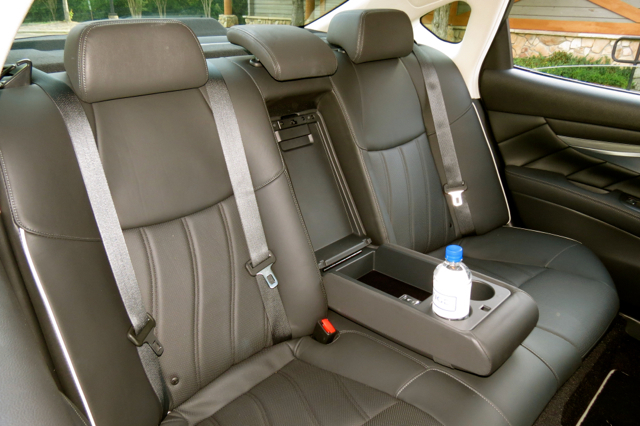 Instead, pull down the center arm rest and pop the lid to find a pair of cup holders and the seat heating switches. That center position also provides access to the trunk, enabling you to bring your skis with you. The only feature missing from the rear compartment are reclining seats. More expensive models as well as the Kia K900 and Hyundai Equus have them. Although the Korean competitors are technically larger sedans than the Q70L, the Infiniti certainly has the interior space for such seats. 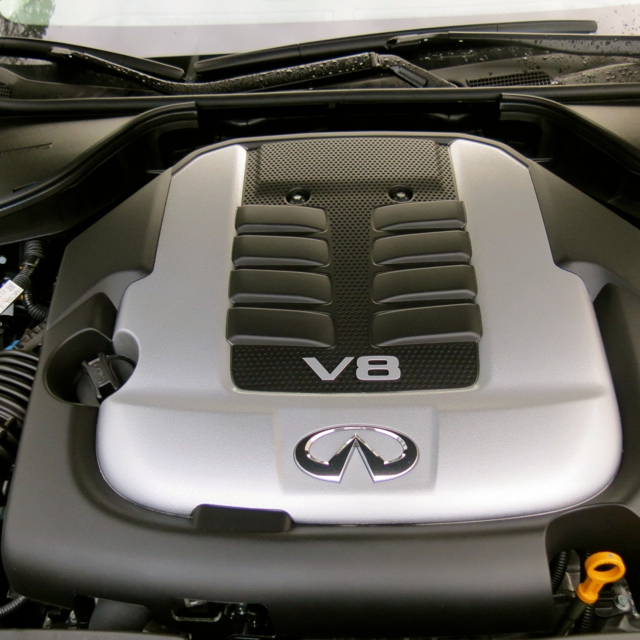 Offering V-6 and V-8 engine choices with the Q70L is a sensible approach for the model line. Both engines are naturally aspirated, with no turbo to be had. Side note: the only turbos you’ll find in the Infiniti product line arrive in 2016; both engines (four- and six-cylinders) will be available in the Q50. 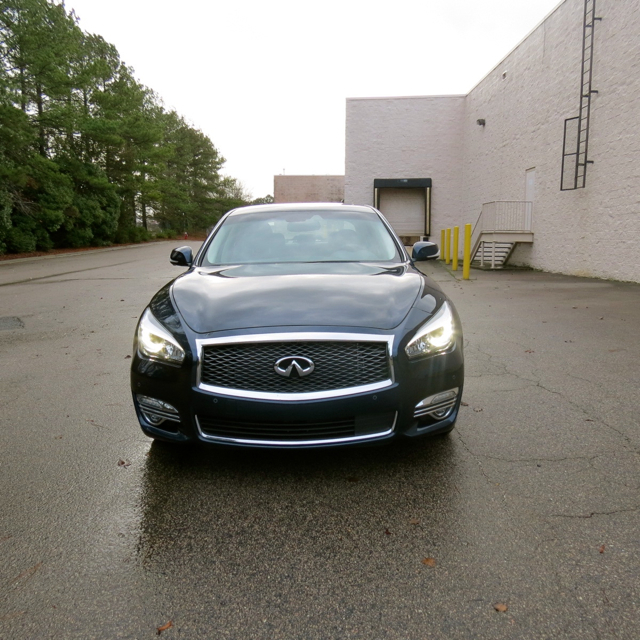 As for the Q70L, the V-6 may be all you need. It delivers 330 horsepower to the 416 horsepower offered by the V-8. 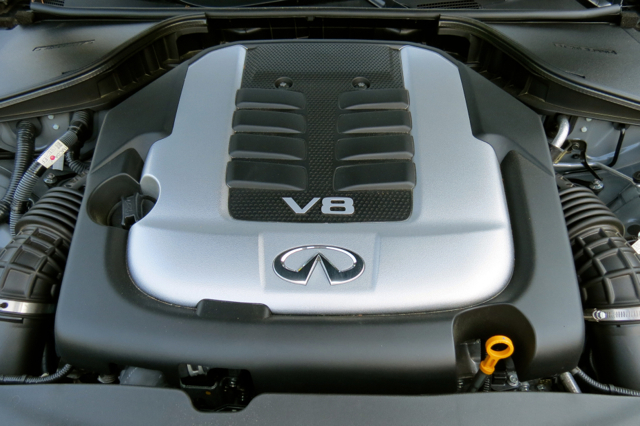 But you almost expect a larger or at least a more powerful engine with this model and that’s what Infiniti also delivers in the V-8. However, that V-8 is not especially raucous — it will push the sedan to highway speeds with rapidity, but it doesn’t deliver the jaw-dropping kick you might expect while passing on the highway. Handling is firm and engaged, with a drive mode feature available to dial up normal, eco, snow or sport modes. The latter tightens the steering and suspension, improving this sedan’s handling. Is it on the level of the BMW 5-Seriesor Cadillac CTS? No, but it isn’t a dawdler either — quite simply, it gets the job done. 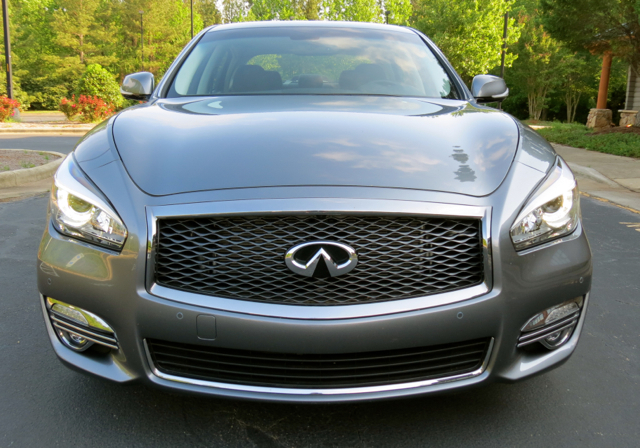 Perhaps the biggest appeal for the Infiniti Q70L is what it isn’t — a German luxury car. Models such as the Audi A6, BMW 5 Series, and Mercedes-Benz E-Class are commonplace although certainly not plebeian. On the other hand, the Q70L is found in such small numbers that your friends are bound to take note of your originality and boldness for not embracing the status quo.